For years, we have been curating our styles with characteristic art and ardour, two essential elements of the Ladurée lifestyle. Each of our interiors is an adventure onto itself. 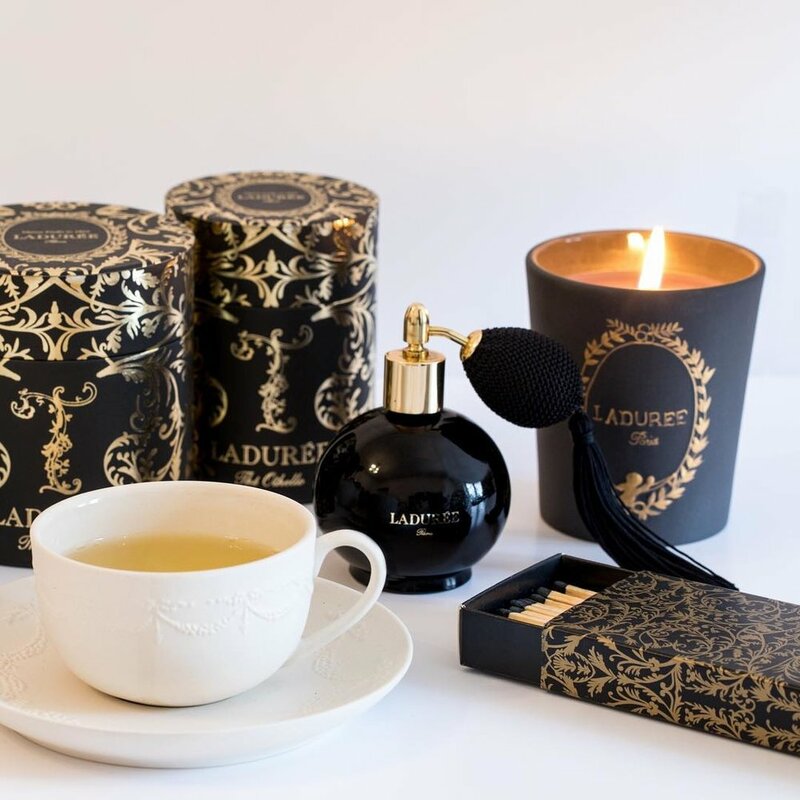 The architects of the Ladurée style are meticulous in their work and impressive in their range; finding inspiration and incorporating the style of various eras from antiquity to modern times. They are passionate about everything they build, paint, sew, and upholster. Each unique object they create is conceived as a dream of made manifest. At Ladurée, where sweet dreams are woven from masterful culinary creations, our interiors couldn’t be anything less than spectacular. Pompoms, braiding, gilt, moulding, silk, marble, crystal, and many other noble materials and sumptuous trimmings form part of our aesthetic, each synonymous with beauty, elegance, and above all, fantasy. Each moment spent in one of our tearooms should be the perfect balance of visual and gustatory pleasure – what we at Ladurée call “the taste of times gone by”. Our feminine influences include Madame de Pompadour, Eugénie de Montijo and Madeleine Castaing, three incredible women with inimitable style who indubitably epitomized and inspired the Ladurée vision. These women were pillars of culture and creativity, and for many years they decorated our spaces with a timeless elegance far removed from the passing fads of contemporary fashion. Green was the original shade chosen for the walls of the first salon on the rue Royale, founded in 1862. This verdant color, in its many variations, has symbolized Ladurée ever since, like the cherub above the entrance to the salon. Originally, however, it was white that dominated the shop-front and the interior décor. Even the pastries had a milky look and were sold in snow-white boxes. The idea then was to be subtly conspicuous, and the shop’s name was painted in Gothic lettering. 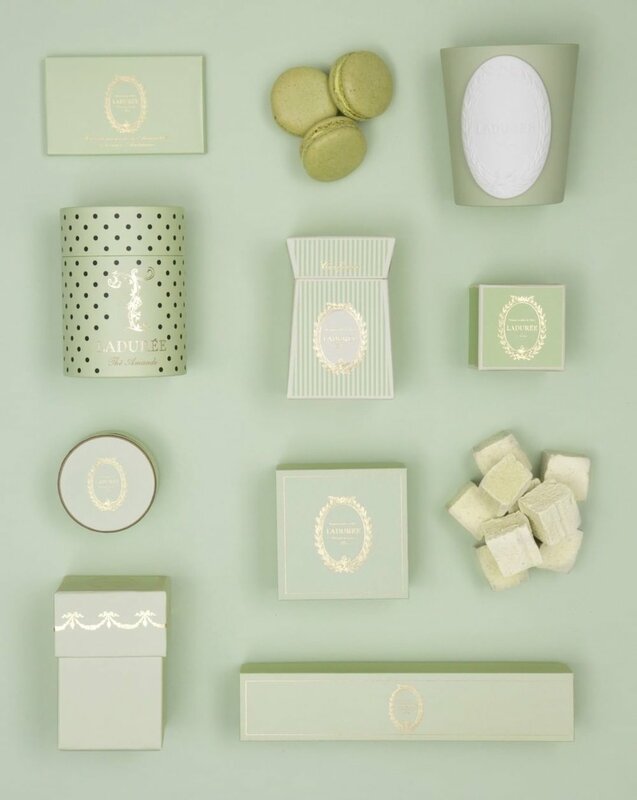 Once an almost military shade of khaki, today the Ladurée green is softer, more sophisticated, and more feminine. Green is not a very common color in cakes and pastries, although pistachio, basil, and lime are exceptions to the rule. Yet it is the dominant hue of a basket of tropical fruit whose heady scents remind us of summer, a sea breeze, and sun-warmed bougainvillea on trellised walls. It is the color of Granny Smith apples, young grass, spring leaves. It is the color of nature, femininity, sweetness, and hope. A natural choice at Ladurée, the rose is the flower of passion, of timeless longing, of eternal youth. Rosewater perfumes the kitchens of Ladurée and flavors its best-loved products. Sweets tasting of rosewater speak to us of love, St. Valentine’s Day, and Mother’s Day. This legendary blossom with its mysterious oriental origins and inherent virtues evokes thoughts of the powdery sweetness of Turkish delight brought back from a journey to Istanbul. But the rose’s taste changes completely when its petals are transformed by human artifice. Enriched with a drop of juice from its blushing sister the raspberry to add a touch of tartness, the rose appears in an astonishing range of guises: the macaron, the Saint Honoré (indeed, the rose-flavored one is the best-selling version), the religieuse, the marshmallow, rose-petal jam, rosewater jelly, and even an enticing rose-flavored white chocolate. Subtle and luminous, untouched by the hand of time, ivory is the color of half-tones, quivering dawns, mother-of-pearl memories. It’s the color of almond paste, white sugar icing, whipped cream, orange blossom and vanilla. The exact opposite of white is black. Black clouds may trouble the clarity of milk-white skies, but the dark delights fashioned in the kitchens of Ladurée are the best antidote to melancholy thoughts and unhappy memories. Black is the absolute ‘non- color’; we use it in pâtisserie to create the most wonderful contrasts. It is the color of Italian squid-ink pasta, Liquorice Allsorts, chocolate, among other delights. 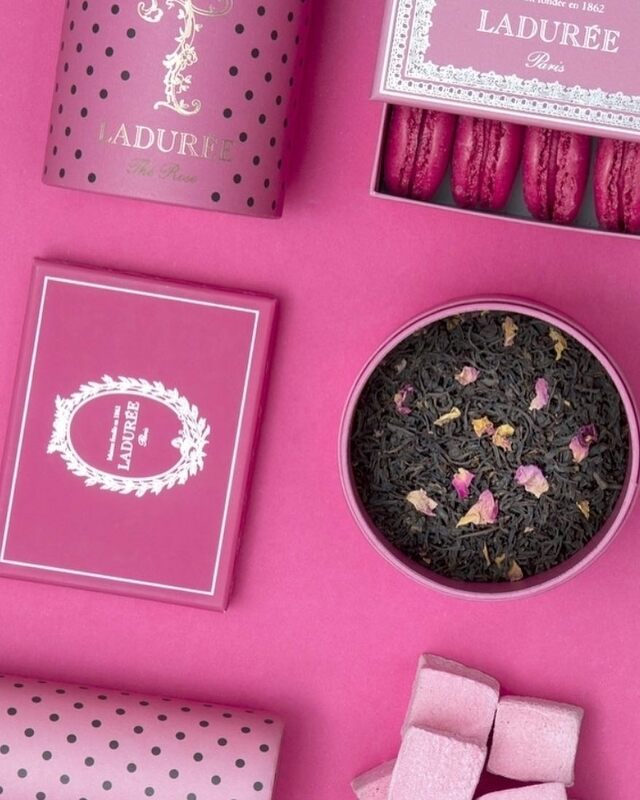 It is also the dominant hue of the Ladurée salon at Harrods in London. There, black defines a world of fairy-tale mirrors, upholstered sofas, walls hung with rich brocade, chandeliers reflected on the skin of caryatids clothed in silver leaf. At Ladurée, the violet is an ode to femininity, evoking the perfumes of the boudoir or the dressing-table of the bedchamber. It pays homage to Madame de Pompadour, Stendhal’s Romantic heroines, and face-powder by Caron. A heavenly fragrance and exquisite flavor at once, it is pretty enough to eat. And eaten it is: it has been adopted by confectioners and lends its flavor to cakes, sweets, even cocktails.